Tourist Grace Millane has been missing since Dec. 1, and failed to contact her family on her birthday Dec. 2. On Saturday, a 26-year-old man was charged with murder in her case after he was detained for questioning. He is due to make his first court appearance on Monday. Millane was on a planned yearlong trip abroad that began in Peru. She arrived in New Zealand last month and was last seen entering a central Auckland hotel with a man on the evening of Dec. 1. 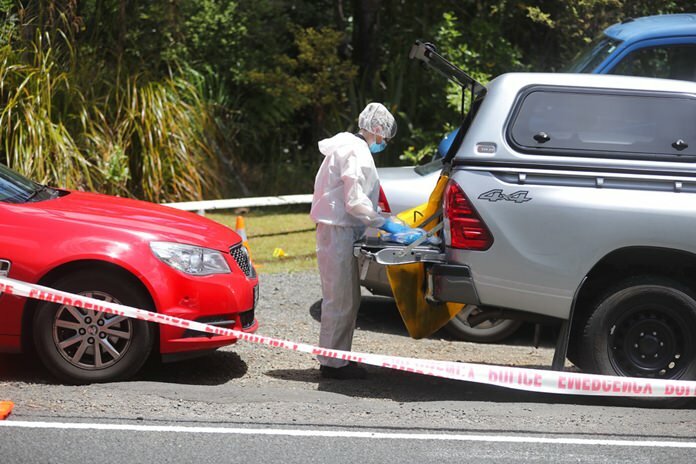 Detective Inspector Scott Beard told reporters near the crime scene in the Waitakare Ranges that police believe Millane’s body was taken to the area in a rental car that was later left in the town of Taupo. Police spent several hours searching the area, which they cordoned off and where they put up a tent, before making the announcement. Millane’s father David Millane traveled from Britain to New Zealand last week. “It is an unbearable time for the Millane family, and our hearts go out to them,” Beard said. Before she vanished, Millane had been staying at a backpacker hostel in Auckland, and she left some of her belongings there. Beard said she met a man for a couple of hours on the evening of Dec. 1 before surveillance cameras showed them entering the CityLife hotel at about 9:40 p.m. Her family was surprised and worried when she didn’t contact them on her birthday or get in touch over on the days that followed. After arriving in New Zealand on Friday, David Millane spoke with media. “Grace is a lovely, outgoing, fun-loving, family-oriented daughter,” he said, adding that she was usually in touch with her family every day.